Let’s continue with the discussion we started in last week’s blog about creating a score key for your experts. Now, here’s the control written as a question that begins with. How well…? 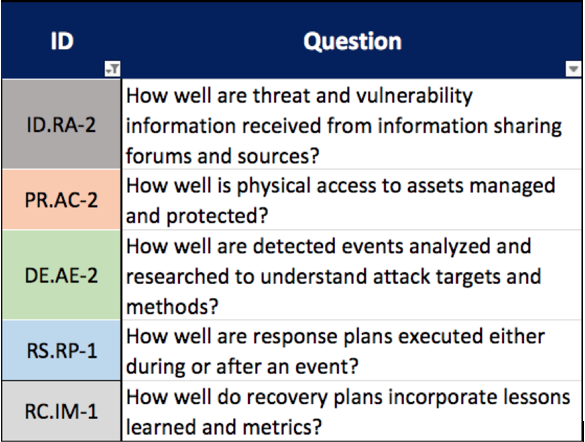 In this example, I’ve list one control from each of the five main functions of the NST cybersecurity framework. Noticed I’ve color-coded the functions without using red, yellow, or green since those colors have implied meaning and would likely cause confusion unless they were associated with a score. Next week, I’ll describe how to get ready to collect scores from your experts.